Ah, you're going to love this, on this day in the year 1909, the famous Dutch clairvoyant and psychic healer Gerard Croiset wss born in the Netherlands. What makes him so special? Well, using his clairvoyant abilities, which manifested early in his childhood, Croiset healed hundreds of patients daily at his clinic. He also worked with various police departments as a psychic criminologist and solved crimes in more than half a dozen countries. His death occurred on July 20, 1980. Also on the night of this day way back in 1712, the Devil visited the young violinist Giuseppe Tartini and played for him in his dreams. 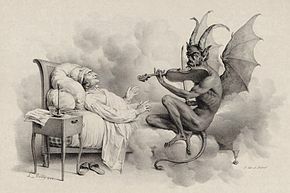 Giuseppe didn't want to wake from this dream, he wanted it to go on and on, but it didn't, but he was left with his greatest work: Devil's Trill Sonata.